In the long-term, all of highsec will be pacified and reborn under the aegis of the New Order. In intelligent circles, that much isn't really disputed anymore. But knowing the endpoint of our journey in advance doesn't "spoil" the journey; rather, it enhances it. Meet highsec ice miner lewby lews. As I was taking a tour of Kamio the other day, I noticed some miners weren't following the Code, so I did what a professional bumper does in such situations. lewby was among those in need of correction. Clocking in at nearly two months old, Kamio is one of the New Order's most ancient possessions. Yet lewby seemed unfamiliar with the New Order and Kamio's Supreme Protector, so I educated him. I did not bring up my combat record to brag: Bragging is something I just don't care to do. I simply needed to caution him about what he was getting himself into. 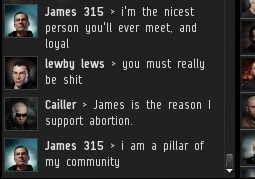 Classic James 315 mercy at work. True, my Invincible Stabber had no weaponry equipped, but I was pretty sure lewby wasn't going to make good on his megathron threat, so whatever. The more he thought about it, I think, the less he wanted to risk a ship against an opponent who was so confident of victory. And yes, frostedflakes actually made so many Hitler references that day, there were some that didn't make the cut on the "Godwin Overload" post. lewby ceased mining and sulked in the Kamio station; apparently he misplaced his megathron. Having failed to defeat my in-game character, he took out after my real-life character. 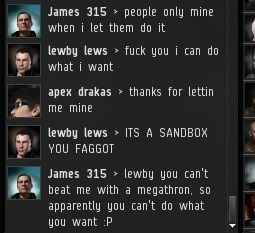 Still languishing in his self-imposed prison with 10 million isk fetters, lewby had a change of heart. lewby wished to negotiate. 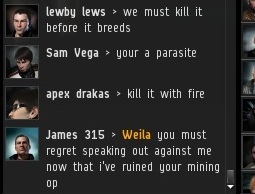 Sadly, 10 million isk only purchases mining rights for one character, not a whole corporation. He was interested in continuing negotiations later, when he had more information about his mining requirements. Finally, he "slightly" apologized for his behavior. Baby steps. I've found that the more a miner is exposed to the New Order, he more he finds himself being molded into our image--the image of highsec's future. If you're dealing with a particularly unruly miner, remember that. The answer is always more bumps, more Order, more MinerBumping.com.